The art of applying eye shadow and decorative accessories to enhance the beauty of eyes is not new. 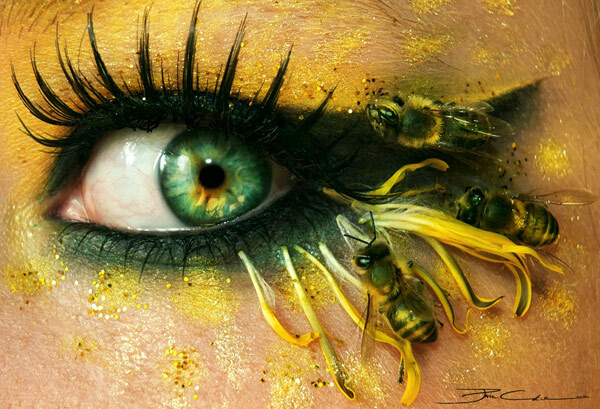 It has been around the time of ancient queens who used flowers colors and birds’ feathers to embellish their eyes. Now, the trend is back in full force and fashion ramps are bursting with models exhibiting spectacularly adorned eyes. Artists from all over the world, like Svenja Jodicke from Berlin (above), are creating their signature styles and coming up with something new every day. If you are in a mood to experiment with the same and are looking out for inspiration, here are some brilliant ideas. Famous celebrity artist Phylis Cohen has very artfully placed the intricate stickers around eyes. The elaborative design has created a beautiful effect. You can buy these stickers at high-end beauty salons. Who could forget the beautiful Elsa of Frozen fame? Inspired by her, this look is perfect to adorn for a Disney themed party. This tactfully created look is perfect to attend a party at night. You can make a pass for the contact lens and simply use it to create a more detailed smoky eye look. Created with subtle silver and metallic green, this breathtaking look is perfect for any nighttime celebration party. This look is ideal for you if you are aiming for a summer party at night. The delicate butterfly brings out the playfulness of eyes. This simple yet beautiful look could be easily achieved by using glitter eye shadow, winged eyeliner and crafty lashes. If you are planning to wear eye makeup art at any party or celebration, hiring professional help is advised especially if you are a novice. Many makeup salons and studios like Aura Beauty Salon at Malad West offer specialized eye makeup art services in India.